'Listen to their slogans and their rhetoric and this becomes immediately clear,' says Aakar Patel. I was a few days short of my 23rd birthday on December 6, 1992. That evening I was at my friend Rajiv Desai's house and he told me that the Babri Masjid had been pulled down. I felt excited by the thought that something new and radical had happened. The next morning I went to open our little shop in Surat's textile market but everything was shut. I telephoned my father to ask what I should do and he said I should wait a while and then return. From our eighth floor flat I could see that by 1 pm, there were several columns of smoke going up all over Surat. I had never seen mass violence before and in a few days over 500 people, mostly Muslims, would be butchered in the city. The columns of smoke were from Muslim homes and businesses being systematically looted and burnt. Of course, my excitement had long vanished by then as the realisation came that something new and radical had indeed happened but it was not in any way positive. The writer V S Naipaul, who spoke no Indian language but was able to examine our society quite deeply, felt that the movement against the mosque was a positive thing. His explanation was that Indian society was the way it was -- meaning poor, dirty and uninventive -- because the Hindu mind remained colonised and needed to be liberated. The violence and energy released by the demolition would bring positive intellectual change. This was not based on scholarship, but his impressions. If one thinks about this seriously it is quite ridiculous. It assumes that all the centuries of rule by different dynasties -- Afghan, Turk, Mughal and Persian -- which all fought each other, were one continuous thing. It assumes that colonising rulers who were not Muslims (for example, the Maratha Gaekwads in Baroda or the Scindias in Gwalior) were different and did not tax or oppress their populations. It assumes also that all parts of India were ruled by Muslims. This is not true. Naipaul was not an academic and therefore not challenged properly on his thesis. No proper scholar would make such a sketchy argument and none has. Did the collective Hindu mind get liberated on December 6, 1992? No, it did not. We are not a different nation in any way. The big change in our collective thinking came from the liberalisation policy of Manmohan Singh in 1991 and not the vandalism of 1992. Perhaps Naipaul meant in the long term, but then a quarter century is the long term and already we live in a time when most Indians alive today were born after the demolition. Surely it cannot have affected them. There is no liberation. The one change that has come is that we have become more easily communal in our expression as a nation. Today the political parties and the mass media can say reckless things that they perhaps hesitated from saying before 1992. We had news that 200,000 people from the Vishwa Hindu Parishad and the Rashtriya Swayamsevak Sangh were gathering in Ayodhya. Some 5,000 Shiv Sainiks under Uddhav Thackeray and his son also went. 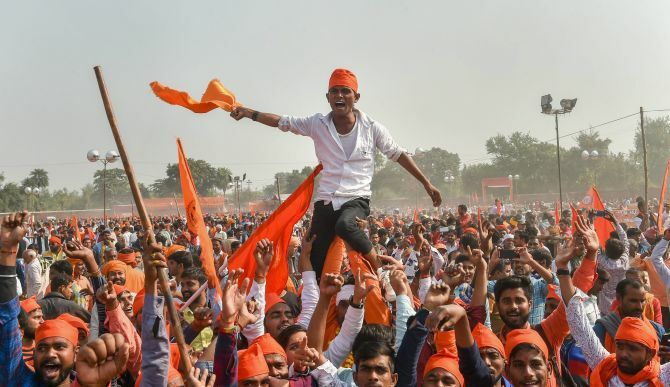 They announced, rather ominously, that this will be the last Dharma Sabha in Ayodhya. The sentiment that made the BJP popular in that period was negative. Meaning that it was communally charged. It was against the mosque rather than in favour of the temple. This is why the Ram Janmabhoomi movement collapsed after the demolition and the violence it produced. It remains negative today and it is intended to punish other Indians. It is not with feelings of devotion or piety that these people are gathering. It is mostly with emotions of hatred. Listen to their slogans and their rhetoric and this becomes immediately clear. Nothing positive and productive can come out of such bitterness and hate. Naipaul did not understand that. But then for him the stakes were low. He could offer his casual opinions on our society and take a return flight back to his home in England. We have to live in this country with other Indians. We should be wary of the demons we let escape when we set about liberating the collective Hindu mind.